The first page you come to after logging in is your Samba Live Dashboard. This is where you’ll start your Samba Live journey and perform actions like scheduling meetings and managing accounts. We’ll explore these in more detail in their own sections – just click on the respective links to learn more. For now, let’s take a closer look at your Dashboard. Is the “quick meet” option, and is designed for 1-on-1 on-demand sessions or smaller, defined, groups. 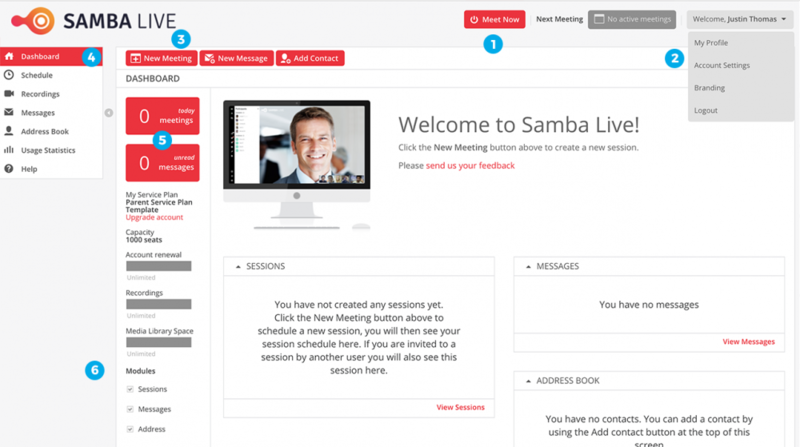 When you click on “Meet Now,” Samba Live will instantly create a virtual meeting room and log you into it. You can learn more about this in our “Meet Now” section. This is where you’ll have access to your profile and account settings, as well as customization options via “Branding.” If you wanted to log out of Samba Live, you would do so here. Click on “New Meeting” for a session involving larger groups of people or sessions where you’re not quite sure how many participants you’ll have. New Meeting provides you with all the options you need to set up a scheduled session, a scheduled webinar, as well as more advanced settings to customize each meeting/event to suit your needs. In this side bar, you’ll have access to the different parts of Samba Live outside of the actual meetings. Everything from scheduling to your recordings are accessible through this menu. These blocks let you know the number of sessions you have schedules for the day. You can directly click on these blocks to get to your sessions as well. Unchecking these boxes hides the modules just to the right of them. Note: You can drag the modules around and organize them as you prefer.